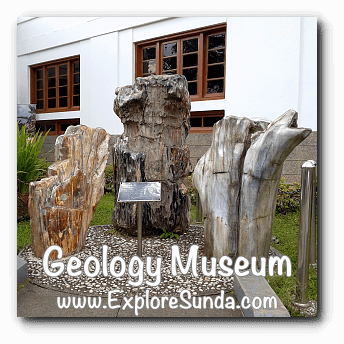 Geology Museum is the biggest and the most attractive museum in Bandung. Most of the visitors are groups of students, coming in buses arranged by schools from cities all over Indonesia. Smaller portion of the visitors are families. 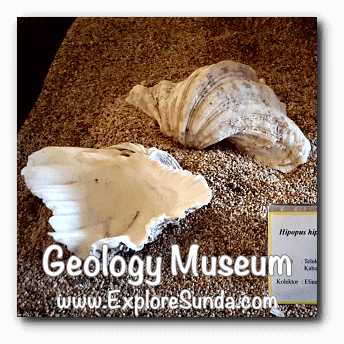 The history of this Geology Museum was started in 1850 during Dutch colonization. That year the Dutch government in Indonesia established Dienst van het Mijnwezen, an organization to survey and do some researches on the geological materials in Indonesia. They need the minerals to support the industrial revolution in Europe. When this organization had collected plenty of minerals, fossils, maps, and such, they need a place to store and analyze them. Hence, they built a Geologisch Laboratorium on Rembrandt Straat in 1928. Unfortunately, we lost many documents during Japan colonialization and post-independence war. 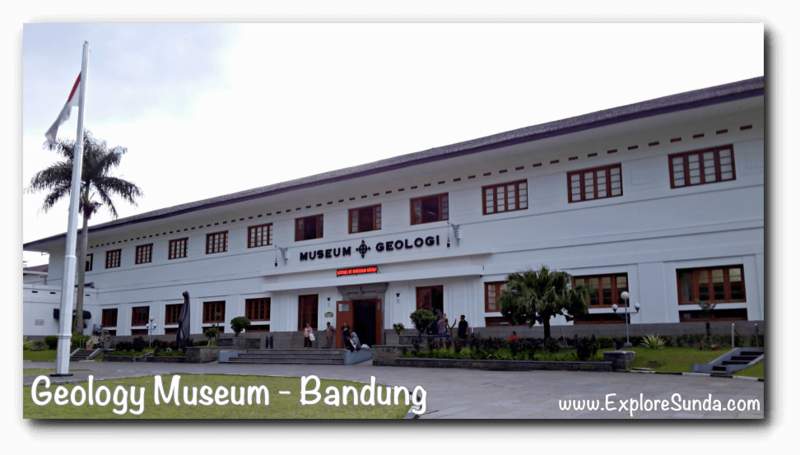 Back to present day, the name of Rembrandt straat was replaced with Diponegoro street and the Art Deco building of Geologisch Laboratorium has become the Geology Museum. This museum was renovated to its current look during 1999-2000, funded by JICA (Japan International Corporation Agency). 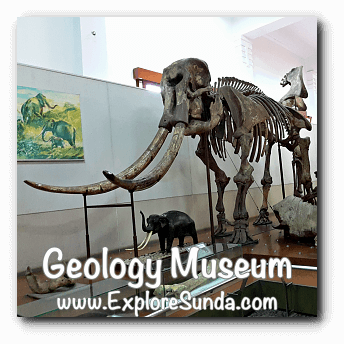 As soon as we step into the museum, a fossil of a Blora Elephant (Elephas hysudrindicus) greets us. It stands tall in the middle of the hall. This male elephant lived 165,000 years ago and died at the age of 49. 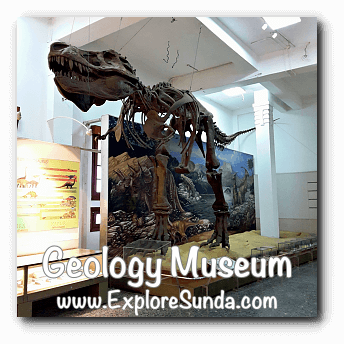 Its fossil was found in Blora district in 2009. The discovery of this fossil is extraordinary, since 85% of the fossils remain intact. 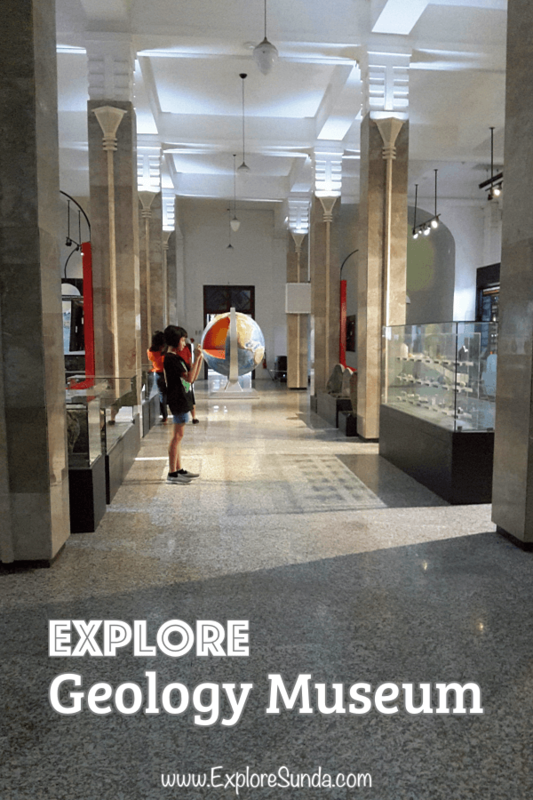 From this hall we have three choices to explore: to the left we explore Geology of Indonesia, to the right we explore the History of Life, or we go upstairs to explore Geological Resources, Benefits and Disasters. This section is located in the west wing of Geology Museum. We just need to turn left from the main entrance. 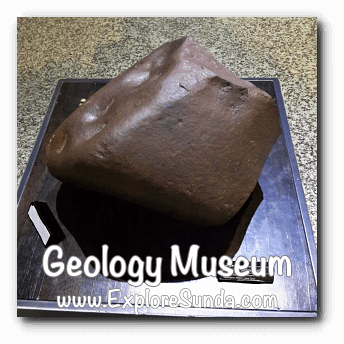 The first exhibit is about the Origin of the Earth. Here we will see the collections of meteorites. 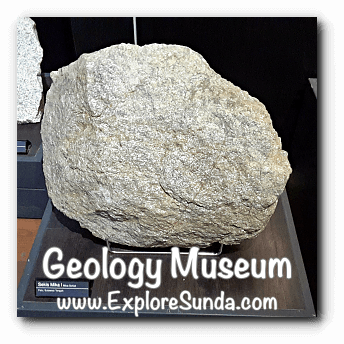 The biggest meteorite exhibited is the Jatipengilon that found in Madiun, East Java on March 19, 1884. Its weight is 156 kg. 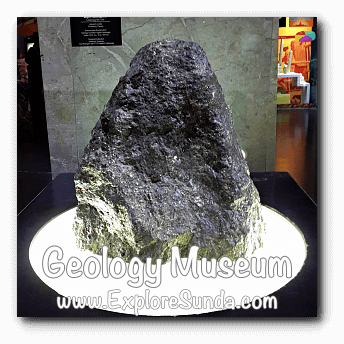 Aside from the extraordinaire Jatipengilon meteorite, the museum exhibits many kinds of minerals (e.g. 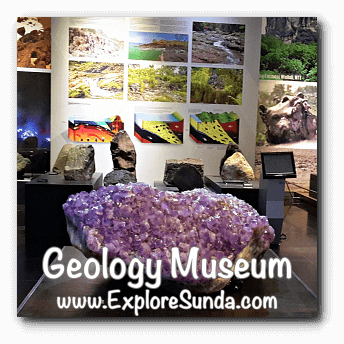 quartz, amethyst, etc) and rocks (e.g. diabas, diorit, sekis mika, lava basal, granite, etc) from all over Indonesia. In one corner we can watch a short movie on how the forces formed the earth. 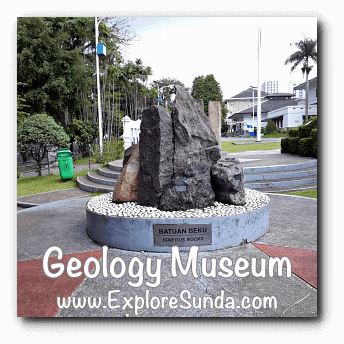 Then there is a special exhibit about volcanoes in Indonesia. There are 129 active volcanoes in Indonesia, no wonder people say we live in the Ring of Fire :) More specific information is provided on the popular volcanoes such as Anak Krakatau, Tambora, Merapi, Batur, Tangkubanparahu and Bromo-Semeru. 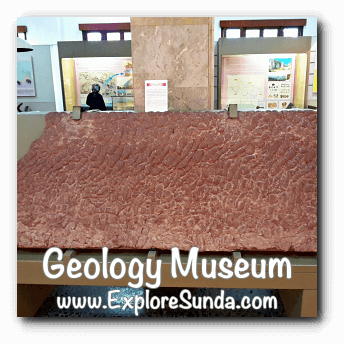 Other exhibitions in this section is about the geological characteristic and basins in Indonesia. We will also learn the evolution of Indonesian archipelago since 50 million years ago, based on the theory of plate tectonics. 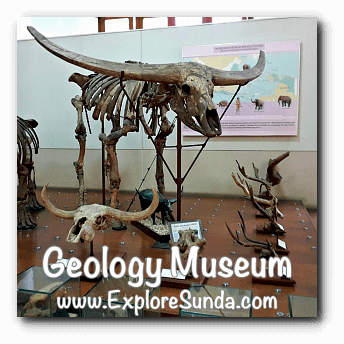 Next we go across the hall from Geology of Indonesia into History of Life gallery. We will found lots and lots of fossils here, from many different time frame. The oldest fossil is Stromatolite from 3.5 billion years ago. 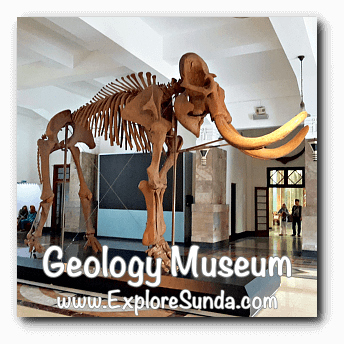 This museum also has trilobit from Pre-Cambrian period, a replica of Tyrannosaurus rex (T.rex) from Mesozoic, and ancient mammals from Indonesia, such as elephant (Sinomastodon, Elephas, Stegodon) from Quarternary period of Cenozoic. Stegodon trigonochepalus, the ancestor of Asian elephant. A corner of this museum has quite detail information of the dinosaurs. Then as a souvenir, you just need to go to the 3D photo studio at Geo Museum Store and pose with the imaginary dinosaurs! 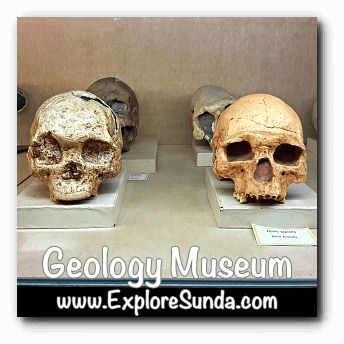 At the end of the hall there is a room, exhibiting various replicas of ancient skulls, including the famous Java Man (Homo erectus) from Sangiran. 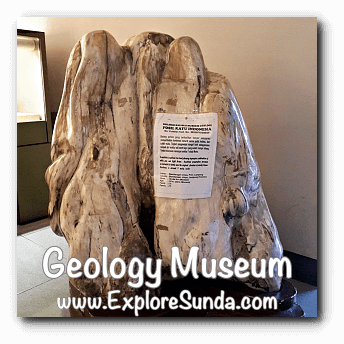 We also can see several beautiful petrified wood (fossils of wood), they don't look and feel like wood anymore, over million years the wood turn into stone. 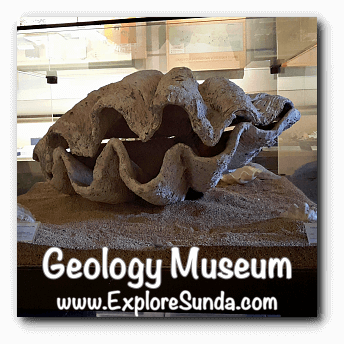 Do you know that shells we often find in the beach are part of the fossils? Most of them are small but one is stand out. It is a giant shell called Tridacna gigas found in Tomini bay, Sulawesi Tengah. 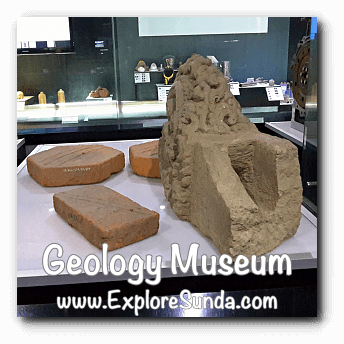 Last but not least, there is an exhibit of geological evolution occurred in Bandung, starting from under the sea level, then a giant active volcano named Sunda merged and erupted, the caldera became an ancient lake. When the lake dried, human lived there until now and it becomes the city of Bandung. The fossils exhibited there witnessed this evolution. One of the complete fossil is a fossil of snake python reticulatus. Going upstairs to the second floor, we go to see the Geology for Human Life Gallery, exhibiting the geological resources, their benefits for the human mankind as well as disasters we will face when they are used unwisely. This section is a modern gallery supported with audio visual technology. The first exhibition is a short movie on how a volcano merges until it erupts. 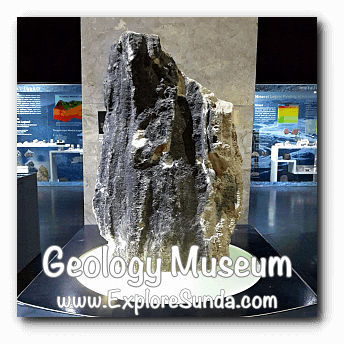 We also can see many showcases of various minerals, both metal and non-metal. For example: gold (Au), silver (Ag), platinum (Pt), copper (Cu), tin (Sn), zinc (Zn), iron (Fe), marble, iodine (I), granite, feldspar, and sulfur (S). Indonesia is the major producer of nickel (Ni), tin (Sn) and manganese (Mn). Indonesia is also rich with many gemstones: garnet, jade (nefrit), emerald, ruby, sapphire, and diamond are some of them. They are so beautiful. Sinter Karbonat from Cisolok, Sukabumi. Mostly found on hot springs. Chalcopyrite Ore from Grasberg, Papua. They are the raw material of copper. Jaladwara figure from Trowulan, Mojokerto, East Java. It is a water gutter in Majapahit kingdom. Other thing we excavated from earth is the oil, gas, and coal. In addition to the information in the gallery, there are some miniatures of the offshore oil platform (oil rig). At the end of this section we are reminded that sooner or later the energy from oil, gas and coal will run out. Hence, we should use the renewed energy more. Being an archipelago with lots of active volcanoes, Indonesia is very suitable to extract energy from water and geothermal. This Geology Museum used an old building from the Dutch era. Hence, it has a massive front yard. 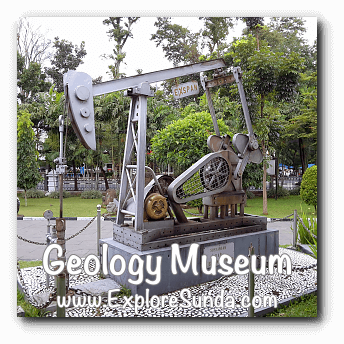 The garden is beautifully sculpted and decorated with rocks, petrified wood (fossil of wood that had aged million years old) as well as some machines used in an oil rig. There is a small souvenir shop near the entrance door of the museum. We buy the ticket to the museum here. 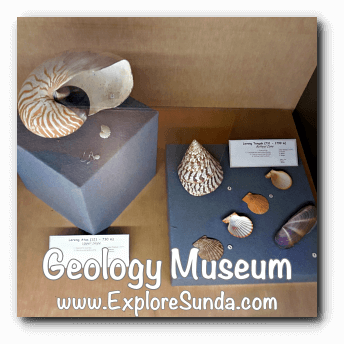 We can find some stones for jewelry as well as some geology books there, including the guide book to the geology museum. We also can buy t-shirts printed with various things about Bandung or batik bandana at the sellers on the pedestrian walk in front of the museum. The price is absolutely more expensive than in the market such as Pasar Baru Bandung, but it's worth a try if you don't have time to shop around in Bandung. The museum is located at Diponegoro Street. 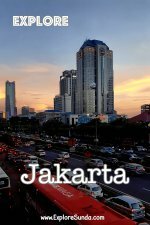 It is approximately 500 meters from Gedung Sate, the West Java government office. Often we can not see the museum clearly from the street when several buses park in front of it. There is not any parking lot inside, so we just park on the side of the street. 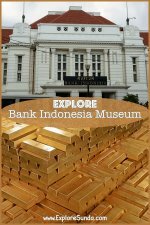 Check out other museums in Bandung, they are vary in themes, each offers a unique angle. 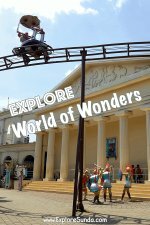 Besides museum, Bandung has a lot more to offer, this city is very famous as a shopping paradise, it also has many great outdoor activities, especially in the outskirt such as Lembang and Ciwidey. Have you explore them all?